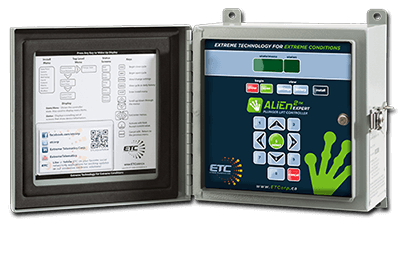 What to look for when purchasing a plunger lift controller - Extreme Telematics Corp.
First and foremost, a good controller should be able to increase production. This obviously depends on current production rates and the capability of the well, but having a controller with a number of different types of optimization is key. A proportional optimization based on plunger arrival time (average velocity) can double production compared to static times in some cases. Other wells may respond better to using casing/tubing pressure optimization. In the US, Class I, Division 2 has been the standard for plunger lift controllers for the last decade. Meanwhile in Canada over the same period, major producers have shifted to using Class I, Division 1 and now the newer IEC standard, which is Class I, Zone 0, which is the most stringent hazardous locations standard and the most safe. Look for controllers and sensors that are minimum Class I, Division 1, if not Class I, Zone 0. The most modern controllers will be certified to both. A common safety problem in plunger wells is repeated fast plungers. Any controller should have the ability to automatically shut in the well after several subsequent fast arrivals. The limit for the number of consecutive arrivals allowed before shutting in should be user-configurable. Beyond that, some controllers will have a dangerous arrival feature that allows you to set a threshold for the fastest single arrival that is allowed. If even a single arrival comes in at or above the specified velocity, the well is immediately shut in. Most controllers allow you to configure times for the plunger to fall or rise. They also have another time for the target arrival when optimizing. The reality is that these times are actually related to the velocity. To get the time, you use the desired velocity and the well depth. Some controllers simplify the process by having pre-programmed velocities that can be tweaked. Any time that the well depth or a velocity is entered, the corresponding times are automatically calculated. One of the biggest problems with oilfield controls in general is that the local interface usually features a liquid crystal display (LCD). This technology is very susceptible to fluctuations in the ambient temperature. As the temperature drops, the display gets sluggish and eventually freezes all together. At high temperatures the display will black out. Pay careful attention to the actual temperature the display will work at. Some display technologies such as vacuum fluorescent display (VFD) will run the exact same whether it is – 40F or +160F outside. Another common problem is the power consumption of the controller. In many cases, the design is not efficient and doesn’t account for the fact that a battery’s capacity is 50 per cent or less when it is cold outside. Make sure you ask the manufacturer what the battery standby time is in the middle of winter, not just in perfect conditions. Battery standby is something that most manufacturers will list on the specifications. This is the amount of time the controller can run without charging the battery. Be careful to see what conditions were used to determine this number. In a lot of cases, it is specified at warm temperatures with very minimal interaction and no devices. Even then, most controllers will have a standby of less than two weeks. This is an important consideration as this won’t hold up in the dead of winter in more northern regions. If you were to add a plunger arrival sensor and a couple of pressure transducers, you would now be down to only days of standby. As soon as there is a few cloudy days, you’ll be running around replacing batteries. Some of the more modern controllers with low power components will actually have a standby time of five months or more giving you lots of flexibility to add devices or adapt to non-ideal conditions. Purchasing decisions are typically based on the sticker price up front. The problem is that many people forget that there are many other costs during the life of an electronic product. What if there are bugs in the software and it has to go back to be reprogrammed? What if the electronics fail and need to be replaced? It could freeze up in the winter, or run out of battery. These are all things that should be considered prior to purchase. Be sure to ask the manufacturer what their failure rates are and what the warranty is. You’ll be surprised how many headaches you can deal with and how much you are on your own after you have bought and installed the product. One often overlooked detail is the ability to upgrade. All software has some issues or missing features. You want to ensure that you are able to get the latest and greatest software as it becomes available. Ideally, new software can be loaded in the field without having to replace parts or send it back to the manufacturer. This is something that should be standard with every control product in the oil and gas industry. You would be surprised at how often it is overlooked. Not only should there be a way to communicate with the controller, but it should support a standard protocol like Modbus that is supported by most SCADA systems. Be careful when evaluating this as you need to understand what features and settings can be accessed remotely. Many manufacturers will limit the available functionality. It is important to also check to see what SCADA systems have been integrated with the product. In many cases, it won’t be supported and there will be a large development cost to build the appropriate drivers to connect. Many controllers will have the ability to control up to two valves (sales and valve B). Look for a controller that has the ability to control a third valve independently of an auto catch. This allows you to wait until the plunger arrives before engaging the auto catch, reducing wear and tear. You can also delay the release of the auto catch to drop the plunger after the well has settled. Without this independent control, the auto catch will only be able to engage and disengage with the operation of the sales valve. All controllers have some sort of tracking or history. Ideally, you will have individual cycle information as well as summary information for the day and time. Daily summary history will allow you to compare days to see if you are performing the same or better than previous days. Two weeks of daily history should be a minimum to ensure you don’t have to make more frequent visits to the well site. Some plunger controllers have a couple of other handy tracking features. Plunger tracking allows you to see how many runs of the plunger have occurred and the distance it has traveled over a given period of time. Seeing this remotely allows you to gauge the wear on the plunger and can be incorporated into a scheduled maintenance plan. Vent tracking allows you to keep track of how often the well needs to be vented to get the plunger to come to surface. Many governments are looking to reduce or eliminate venting. Get ahead of the curve and start tracking your venting today so that it can be continuously improved. Of all the things on the list, price is listed at the bottom. It is still important if all other things are equal. It really doesn’t become a factor if the controller is costing time and money for maintenance and losing production. On the other hand, a reliable controller that helps you achieve maximum production will pay for itself in only days or weeks.